JUST ADDED: Another Marbling Class in March! Ready to jump into spring with some creative fun? Want to learn something new (or develop your marbling skills further), play with color and concept, and work hand-in-hand with the elements of surprise, wonder, and awe? Then I invite you to join me at BookArtsLA for my 2-day Introduction to Paper Marbling immersion class on March 16-17, 2019! As I’ve said before, this is one of my favorite classes to teach because we get TWO FULL DAYS to dive deep into technical skills, traditional patterns (and variations of patterns), techniques, and troubleshooting (the key to any successful marbling session! )...with time for play and experimentation in the tank too. There is a maximum of eight students so there is a lot of personal attention! And the best part is that everything is provided for you. You just show up and have fun! For more details or to register for the class, visit www.BookArtsLA.org or click on the link below. My first class of the new year will be at CREATE Center for the Arts in Palm Desert, CA. I’m really excited about being able to teach at this beautiful facility with lots of natural light and a spacious studio for individual marbling stations. And I’m thrilled to bring the joys of marbling beyond the LA area and into to the desert! This is one of my favorite classes to teach because we get TWO FULL DAYS to dive deep into technical skills, patterns (and variations of patterns), techniques, and troubleshooting (the key to any successful marbling session! )…with time for play and experimentation in the tank too! If you’re looking to try something new (or develop your marbling skills further! ), play with color and concept, and work hand-in-hand with the elements of surprise, wonder, and awe . . . then this class is for you! For more details about the class or to sign up, visit the CREATE Center for the Arts website. Finally…the temperatures are starting to cool off some so that in-studio marbling classes are a possibility! I’m excited to announce the following options for those wanting to explore the world of marbling in-person with me at my studio in South Pasadena. There is a little bit of everything for everyone, including a new MARBLING ON FABRIC class! I’m also giving a discount for early-bird sign ups so be sure to register for class by Thursday, October 11 for significant savings! In this hands-on class, we will walk through the marbling set-up step-by-step from making the bath and mordant to mixing paints and preparing paper. We then will work in the large tank (20x25) to learn the five foundation patterns and venture into advanced patterns as time permits. By the end of class, you will have the knowledge and confidence to start marbling at home…not to mention many beautiful marbled papers! EARLY BIRD DISCOUNT (sign up by Oct. 11): $255 which includes all materials except your fabric PLUS one-year access to my Marbling on Fabric eCourse (a bonus gift valued at $99)! Cost after October 11: $285 which includes all materials except your fabric PLUS one-year access to my Marbling on Fabric eCourse (a bonus gift valued at $99)! I’m very excited to offer this new in-studio Marbling on Fabric class. In this full-day adventure, each student will work in their own marbling tank large enough to marble individual fat quarters. There will also be a group tank that will fit scarves up to 17x73 or a regular quarter yard of fabric. We will learn how to properly prepare fabric to be marbled upon, cover advanced techniques such as overmarbling and masking, discuss strategics for design, learn troubleshooting solutions, and review post marbling curing techniques. At the end of class, you will have approximately 10-15 marbled fat quarters and 3-5 silk scarves. So excited that BookArtsLA is having me back to teach my two-day Introduction to Paper Marbling intensive! 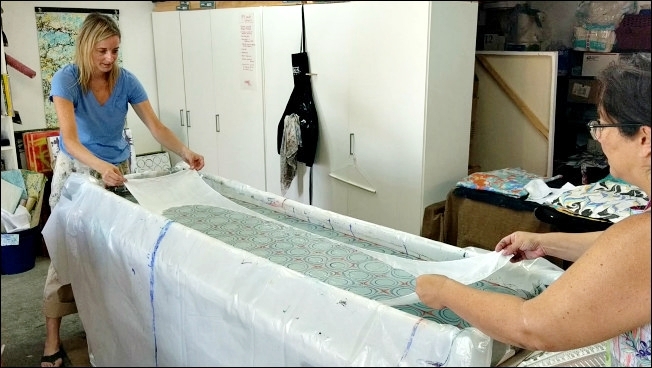 In this immersion class, students will learn the nuts and bolts of the art form, dive into traditional pattern making (foundation and advanced patterns) using the large marbling tank, and have time for creative exploration. You'll leave with a robust understanding of the art form, dozens of marbled papers, and the confidence to start marbling at home. Everything is provided in this class ~ just show up and have fun! To register, head on over to the BookArtsLA website. 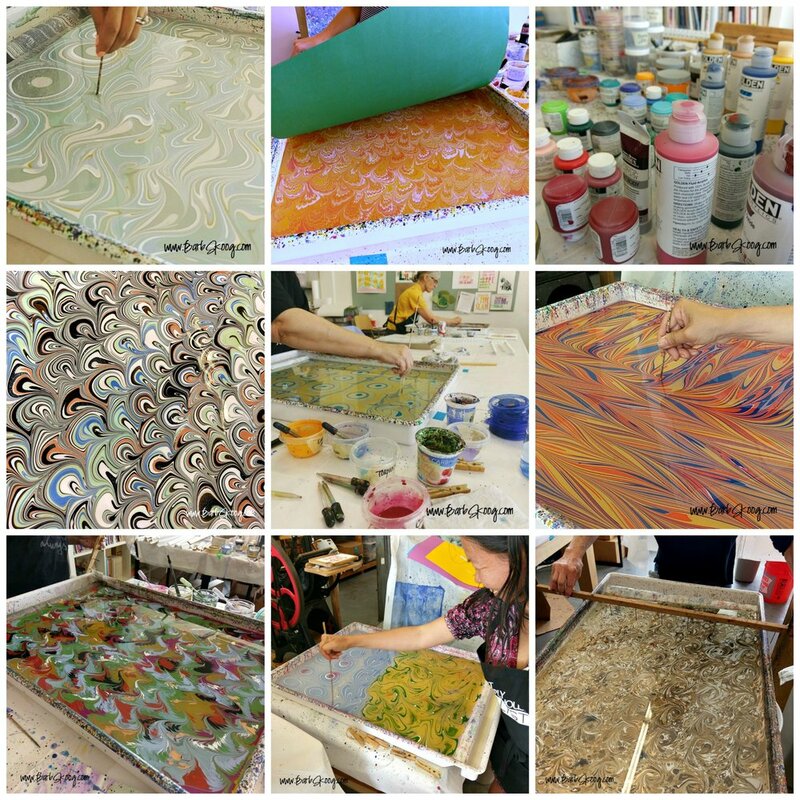 Just a few images of students' work at this weekend's Intro to Marbling class at BookArtsLA. And if you'd like to see a little video of the vinyl LPs we marbled on, head on over to my Instagram account here. The two-day class was a lovely mix of traditional work and contemporary play...exactly how I love to run my classes. And I was so happy with the way students were fearless in their approach to learning. They stepped up to the tank and didn't hesitate to jump in. As is always the case, I wish we had another day to marble together...or another week! I'm excited to be kicking off the spring marbling season with my two-day Introduction to Paper Marbling intensive at BookArtsLA! Well, that was quick! The Beginning Paper Marbling class has sold out (and I only have ONE spot left in the Advanced Marbling class) so I'm adding another beginner class on Saturday, October 28! If you'd like to join in on the marbling magic, I'd be thrilled to take you on the journey. The Beginning Paper Marbling class teaches you everything you need to get set up and marbling at home in no time. The class is fast paced and packed full of information. It is also somewhat physically demanding…we are on our feet all day and constantly moving from one end of the studio to the other. We also will be working both inside and outside of the studio (so you will be exposed to the elements like the sun for brief bits of time). But most of all, we have A LOT of fun. If you are interested in attending, send me an email! Once again, if you are interested in attending, send me an email. Once I have enough people signed up for a class, I will email confirmation and details to you. Can’t take my in-studio class? Let's get some fall marbling fun going! I've had a lot of requests lately for both one-day and two-day classes so I've pulled together a flexible option for October ~ take one class or both! The Beginning Paper Marbling class teaches you everything you need to get set up and marbling at home in no time. The Advanced Marbling class then builds on what was learned to take your marbling to the next level. Both of these classes are fast paced and packed full of information. They are somewhat physically demanding…we are on our feet all day and constantly moving from one end of the studio to the other. We also will be working both inside and outside of the studio (so you will be exposed to the elements for brief bits of time like sun!). But most of all, we have A LOT of fun. If you are interested in attending, send me an email and let me know which class/classes you want to take! Beginning Paper Marbling (6 hours) - SOLD OUT! Advanced Marbling (6 hours) - 1 SPOT LEFT! For those who have taken my Beginning Marbling class (or who have marbling experience), this class is for you! Building upon foundation patterns, we’ll work exclusively in the large, 20"x25" tank and dive into more advanced traditional patterns (like Bouquet, Flame, and Spanish Marble), learn how to use dispersant (for Italian Vein and Fantasy), and marble on nontraditional materials (like corkboard and canvas) as well as 3D objects. Once again, if you are interested in attending, please email me with the class or classes you’re interested in. Once I have enough people signed up for a class, I will email confirmation and details to you. A sampling of some of the patterns taught in the 2-day Introduction to Marbling Class. I'm going to get in one last class for the summer and it will be at BookArts LA this weekend! I so enjoy teaching here. The facility is such a lovely place with lots of room and natural light to work in. And I have had such fun students in these classes ~ full of energy and enthusiasm with a fearless attitude toward playing in the marbling tank! I don't know how I keep getting so lucky! I'll once again be teaching the popular 2-day Introduction to Marbling class. In this marbling immersion class, students will learn the nuts and bolts of the art form, dive into traditional pattern making (foundation and advanced patterns) using the large marbling tank, and have time for creative exploration. You'll leave with a robust understanding of the art form, dozens of marbled papers, and the confidence to start marbling at home. Everything is provided. Just show up and have fun! To register, head on over to BookArts LA's website. Once again, a number of people have contacted me recently about marbling classes and I'm happy to pull together a couple of options for classes in June...including a new option: Advanced Marbling! If you are looking for an adventure in color, experimenting with design, and exploring a new creative world, join me in the studio for a day of marbling fun! In this hands-on class, we work primarily in an 11"x14" size tank with access to a shared 20"x25" size tank. We will walk through the marbling set-up step-by-step from making the bath and mordant to mixing paints and preparing paper. We then will learn the five foundation patterns and venture into advanced patterns as time permits. By the end of class, you will have the knowledge and confidence to start marbling at home…not to mention many beautiful marbled papers as well! The class fee includes all materials (paper, carrageenan bath, alum, distilled water, paints, use of tank and tools, and handouts) ~ just show up and have fun! If you have any questions or to sign up, email to me at Cheers@BarbSkoog.com. Hope to play at the tank with you soon! Clouds on Water: Special Offer and Guided Session! I want to welcome you to the magic: marbling magic. More than 10 years ago, I stumbled upon the art form and fell in love...not just with the end result (which is gorgeous and a world onto its own) but also with the PROCESS of CREATING a marbled piece. It feels so magical: working in the tank, on a water bath, with colors that remain true to their character (no muddy messes! ), accepting with grace the organic patterns and designs that naturally reveal themselves, standing in awe as the image is transferred onto paper or fabric or leaves or wood. This is marbling: fluid beauty reflecting a unique moment in time. Ever since falling for the art form, I've made it my mission to "bring marbling to the masses." And while I would love to have everyone in the world come spend time with me in my studio, I did the next best thing: I created an online marbling classroom so I could come to you! It's time to learn something new, don't you think? This is a great time of the year to give marbling a try. The hectic new year is behind us, routines are back, we're in between major holidays, and the weather is quite agreeable most everywhere for ideal marbling conditions. Guided session with personal feedback! I'm hosting a guided session in June! From June 6 through July 1, I'll be active on our private Facebook pages three times a week (Tuesdays, Thursdays, and Saturdays) answering your specific questions, giving feedback on posted work, and posting bonus videos! To learn more about all three Clouds on Water classrooms and how the eCourse works, head over on the new website: www.CloudsOnWater.com! Hope to virtually stand with you at the marbling tank and interact with you on the Facebook page!! I'm so excited about my upcoming Beginning Marbling classes and the wonderful response to them. The Sunday, March 26 class is SOLD OUT and there are only two spots left in the Saturday, April 1 class. To sign up, email me! There are a few spots left in June's Beginning Marbling class. This is one of my favorite classes to teach ~ it's fast paced and packed full of the information you need to get set up and marbling at home in no time. To sign up, email me at Cheers "at" BarbSkoog "dot" com. In this hands-on class, we work primarily in an 11x14-size tank with access to a shared 20x25-size tank. We will walk through the marbling set-up step-by-step ~ from making the bath and mordant to mixing paints and preparing paper. We then will learn the five foundation patterns and venture into advanced patterns as time permits. By the end of class, you will have the knowledge and confidence to start marbling at home…not to mention many beautiful marbled papers as well!